1. A big rig slammed head-on into a bus full of high school students on I-5 in Northern California yesterday evening, killing ten people, including five teenagers, along with the drivers of both vehicles and three adult chaperones, the AP reports. The bus was carrying low-income and first-generation prospective college students who were on a trip to visit Humboldt State University. Most of the 44 students escaped before the bus exploded into flames. 2. 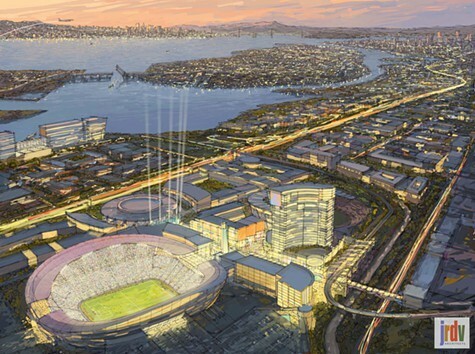 Oakland Councilmember Larry Reid said that representatives from Major League Baseball told him and Mayor Jean Quan that they support a new ballpark for the A’s on Coliseum property — and were not focusing on Howard Terminal, a waterfront site near Jack London Square, the Trib$ reports. "What they said to us is that [A's co-owner] Lew Wolff preferred the Coliseum," Reid told the newspaper. "And if that's where Lew Wolff wants to go that's what Major League Baseball supports." Quan, meanwhile, told 95.7 FM The Game radio that the Coliseum City project has the backing of the future ruler of Dubai, 31-year-old Hamdan bin Mohammed Al Maktoum. 3. The state Assembly approved legislation that would force so-called “dark money” groups to reveal their donors if the groups engage in political activity, the SacBee$ reports. Under current law, these nonprofits can keep the identities of their contributors secret. The new legislation also has the backing of Republicans because it includes a GOP-sponsored amendment that would only require disclosure of donors who make contributions after the bill becomes law. 4. Climate scientists announced that there is now a two-in-three chance that an El Nino weather pattern — which typically brings heavy rains to California — will form in the Pacific by the end of this year, the Mercury News$ reports. 5. And a federal judge ruled that California’s handling of mentally ill prisoners violates the constitution’s prohibition of cruel and unusual punishment because of heavy use of pepper spray and solitary confinement, the AP reports (via Rough & Tumble).